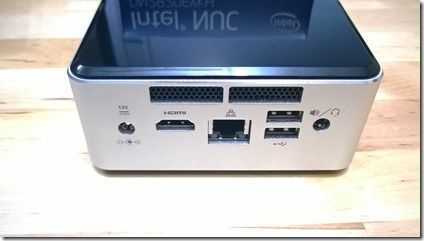 Intel NUC (DN2820FYKH, Celeron N2820) set-up and first test with Android 4.4. 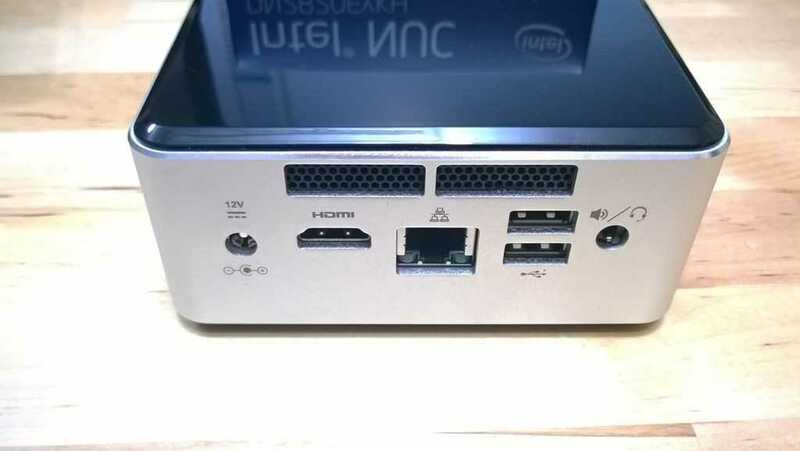 For the purposes of creating an exciting project for myself and something different than 8-inch Windows tablets for the readers I’ve bought an Intel NUC. 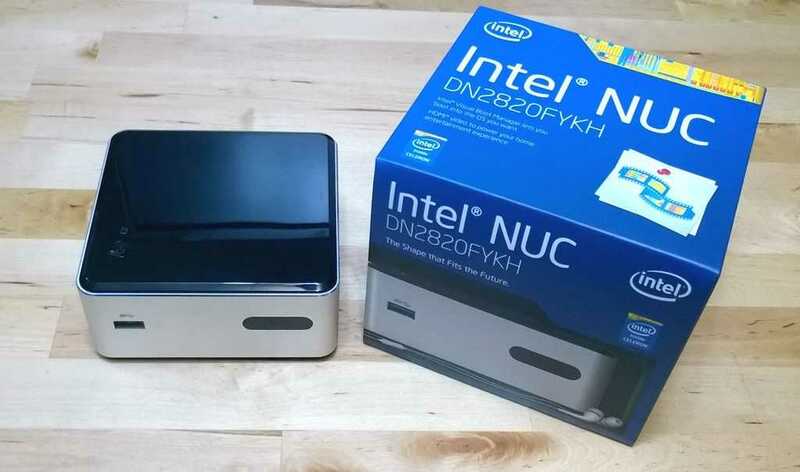 The Intel Next Unit of Computing is now in its second generation and this Baytrail-M powered (N2820) version has been chosen for a number of reasons. Firstly, Intel are building Android X86 for it (and KitKat has already booted and installed without a problem,) it’s new and finally, I’d like to see just how Baytail perfroms in real-world scenarios with a very fast SSD – something we can’t do on the Baytrail-T platform. The Intel Celeron N2820 is a dual-core (no hyperthreading) 2.13 – 2.39 Ghz processor based around the Silvermont CPU you find in all ‘Baytrail’ variants. It’s a 7.5W TDP SoC with 64-bit architechture that can handle a useful 8GB of DDR3L-1066 memory. HD graphics (gen 7) up to 756Mhz clock, USB3.0 and SATA storage interface make it more flexible than any Baytrail-T platform although you won’t get, in this N2820 version, high-end Quick-Sync performance. [The new versions of this product will have an N2830 that supports Quick Sync. If you can find one, it’s better than the N2820 version. You’ll see in the video below that my first attempt at boot-up resulted in no response. I thought the unit was dead until I tried a third, newer stick of memory. I’m currently using a 2GB module from Kingston. (ACR16D3LS1NGG/2G.) 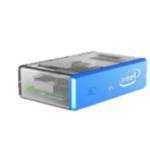 Intel have published a list of working memory modules here. 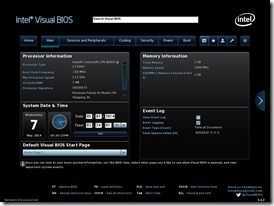 Intel’s Visual BIOS is a much, much easier way to handle BIOS settings. It’s mouse-controlled, interactive, live and far more useful than the old BIOS setup systems of old. 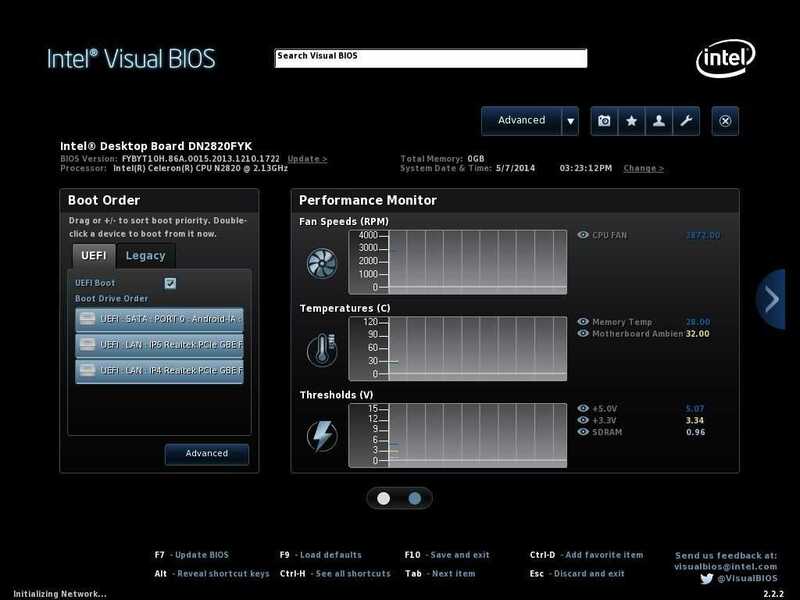 Current fan speeds, voltages and temperatures can be seen and there’s a lot that can be configured over and above the boot-sequence order. There’s even a built-in screenshot facility. More time is needed with this before I can report in detail on Visual BIOS but I’m already hoping to see it on more PCs in the future. 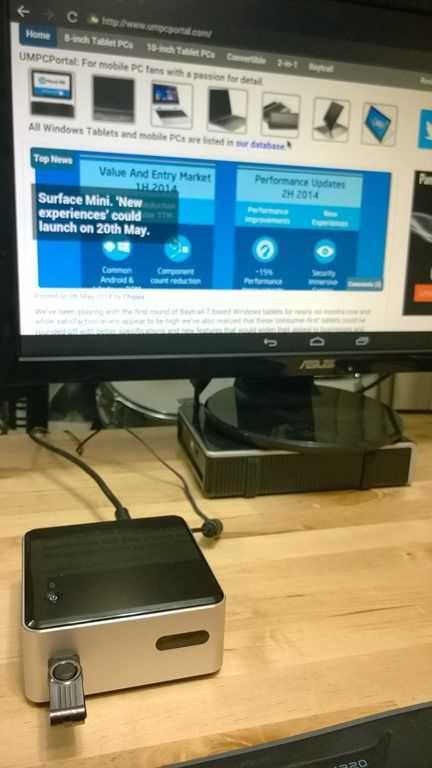 As a quick-start route into OS testing I’ve already installed Android KitKat from the Intel Android site 01.org. Latest downloads are available here. I tested a 28 April 2014 release of Android 4.4 ( android-4.4.2_r1-ia2 – Bat Trail generic.) 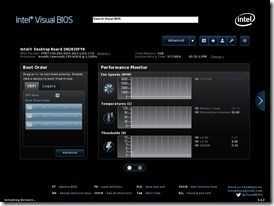 which booted from a USB stick without any modifications to the BIOS. Installation onto the hard disk was simple. This build is a raw Android open-source image without any Google services but after installing the Amazon store I was able to test Facebook, Twitter and a few other apps. 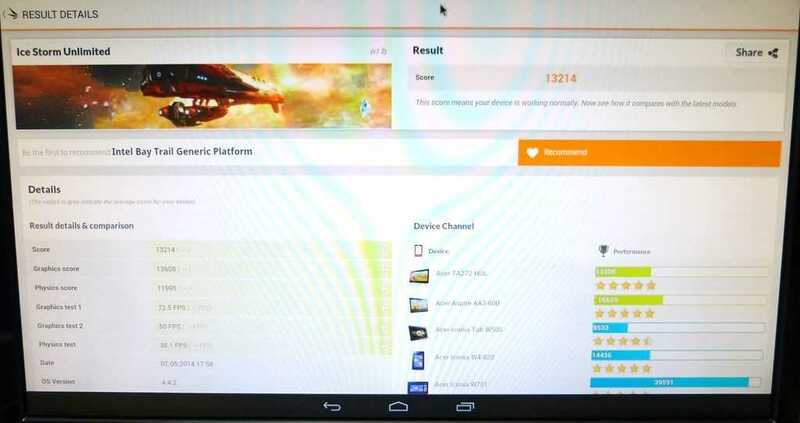 Android 4.4 on Celeron N2820 NUC performance. 3DMark Ice Storm : Maxed Out. In normal operation this mini-PC is very quiet. The fan runs at about 3000 RPM under zero load. After 3DMark IceStorm tests were run fan noise was audible with air rush and mechanical hum. This level of noise is, in my opinon, not acceptable for a home office when the unit is positioned on the desk. 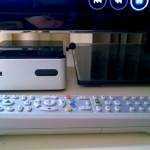 Under a desk or at home TV viewing distances this (max) level of noise should not be an issue. In the current test setup an Acer V5 laptop, next to the NUC, is creating more noise than the NUC. A gallery of various images is available here. It includes internal close-ups and some images of Android 4.4 running. This report is based on the first 12 hours of testing with the Intel NUC. Windows is being installed as this is being written and a follow-up post with Windows performance test results will come within 24 hours. This report will include information on the consumer IR receiver. What would you like to see tested? XBMC? Games? What video demo’s would you like? 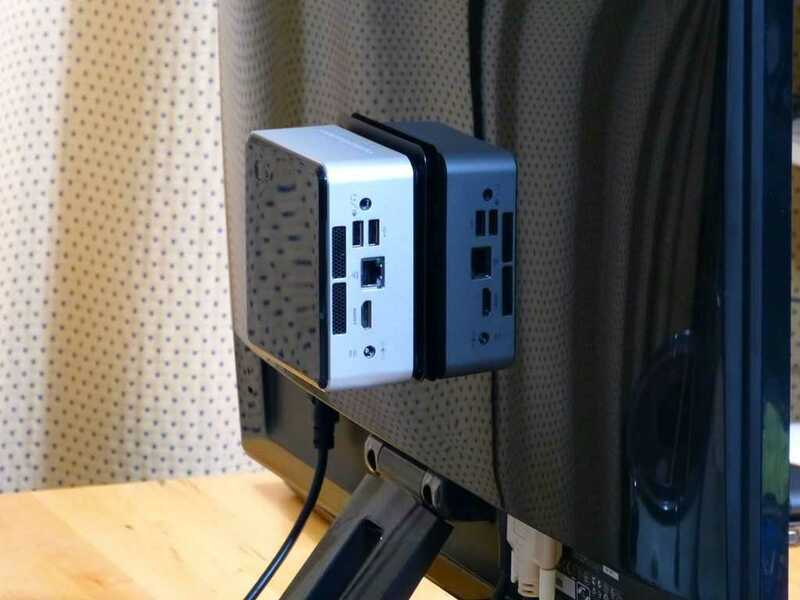 Intel NUC as low-cost media center with Openelec, XBMCbuntu. How-To. I would have hoped it ran at 0 RPM under idle. I just see that as constantly sucking up dust. 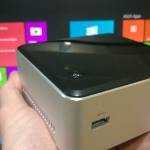 Anyway, I’m interested in these ultra-mini PCs (still UMPCs!). It’d be nice if traditional board and case makers try to enter this market as well. There seems to be increasing interest in mini-ITX set-ups for a while. It’d be nice if they go even smaller. My only experience would be with SBCs (single board computers) but they target the commercial market and are thus on the more expensive side. 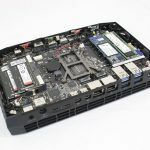 For example, an SBC with an Intel Atom Z530 for embedded use can cost $300+ and that’s not even including a power brick, RAM, storage, case and OS. Interesting point about the fan noise. I’m interested in quiet or fanless computing. It seems that the customisation route is still the best one, I know third party cases exist that replace the supplied one. Fan noise surprises me – I have heard from others that it is not audible. 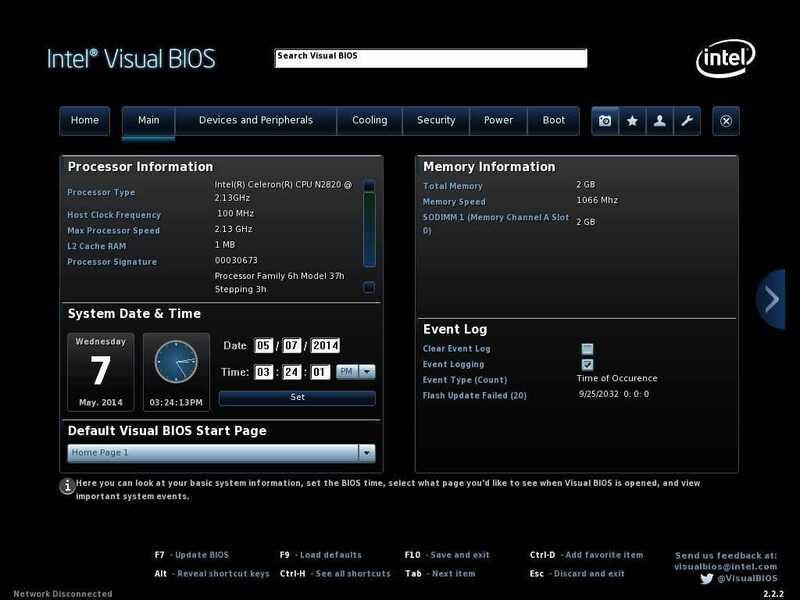 – Update the BIOS – from your screenshots it think you have version 15. The latest is version 32. I am assuming the Android image has not been optimised and the drivers pull too much power. Also make sure you have the latest BIOS. I have heard people having HDMI connection issues with the factory installed version. Regarding fan ‘noise.’ It’s audible on the desk at the fan speed mentioned (idle) but mounted behind a monitor you can’t hear it. Plus, there are tweaks and BIOS updates to be done. I’m nearly ready with the Windows 8 performance report. It should go out this evening. Which of the Baytrail-M chips have Quick Sync? What else do those newer chips have? AES-NI, turbo, hyperthreading, etc.? Chippy I’dd like to see you try DVD playback. Not sure if Linux or Win8 would be best. What do you think? 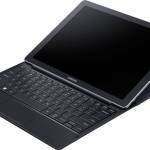 « Surface Mini. ‘New experiences’ could launch on 20th May.